Jacket Required is the UK’s only premium, contemporary menswear and selected womenswear show. The bi-annual show in London attracts 97.6% of visitors with purchasing responsibility, from retailers including John Lewis & Partners, Couverture & The Garbstore, Urban Outfitters, Harvey Nichols, Mr Porter, Oi Polloi and Selfridges. Not only does the show get the buyers and press attending but all the brands who are carefully curates have a strong sense of commitment to sense of timelessness. There is an element of longevity amongst the brands, one that champions lifestyle over trends and has craftsmanship at their heart. Jacket Required also act as a platform for brands and the wider industry to come together and find a way to approach topics such as manufacturing and sustainability. With a continued commitment to promoting the sustainability discussion, the forthcoming show on Wednesday 23rd & Thursday 24th January 2019 will feature ‘In Talks With’ panel Crafted to Last – the movement towards slow fashion’ moderated by British fashion commentator and Professor of Diversity Caryn Franklin M.B.E. MSc (Psych) MBPsS. Caryn Franklin will speak with; Christopher Raeburn, Stacey Wood, founder of King & Tuckfield (who we spoke to for an insightful Q&A) and Hans Ates, founder Blackhorse Lane Ateliers (who we had a wonderful conversation with for our podcast episode 14). Blackhorse Lane are also holding a denim repair workshop, and G-Star raw will be sharing their vision for G-Star RAW For The Planet: Our Journey Towards Positive Impact. Talks are free to attend via registration. 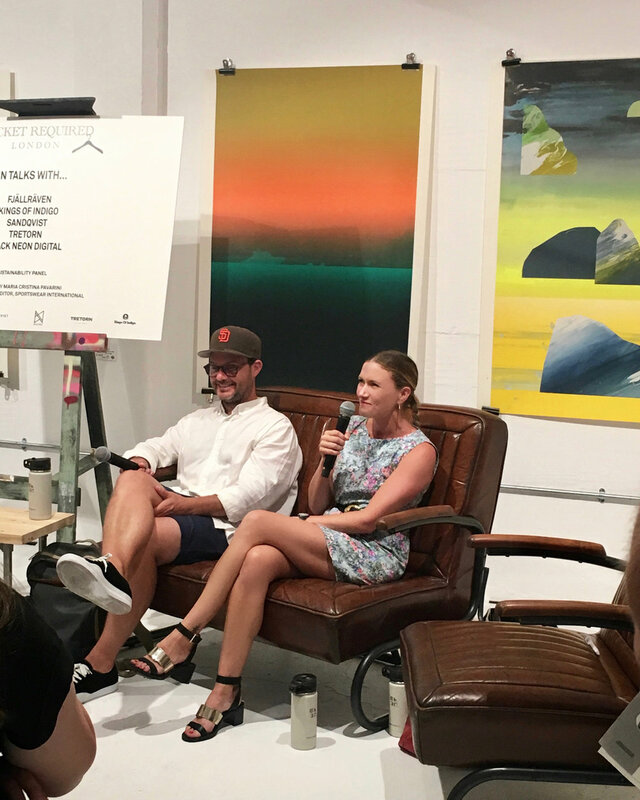 At the previous show in July 2018, Jacket Required and Sportswear International hosted a ‘In Talks With - Sustainability Panel’ featuring Black Neon Digital founder Jodi Muter-Hamilton alongside Tony Tonnaer, founder and CEO, Kings Of Indigo; Bode, group chief sustainability officer, Fjällräven; Henrik Lindholm, sustainability manager, Sandqvist; Fredrik Ekström, head of marketing and communication, Tretorn. The discussion was moderated by Maria Cristina Pavarini, senior features editor, Sportswear International who also wrote an online article featured on Sportswear International. We spoke with panellists from the July In Talks With discussion to understand their approach to sustainability for their brands, and the future of the industry as a whole. 1. What are the biggest challenges you face when it comes to manufacturing sustainably? TONY: The choice of sustainable fabrics are still very limited. Especially in more special constructions and compositions. So we have to develop a lot of special fabrics with our mills which requires higher minimums for production. So less flexible. We need to do a lot of extra work and investments in order to have our suppliers Fair Wear audited. And are less flexible to develop relations with new suppliers. So we focus on fewer suppliers and longterm relationships. AIKO: Achieving a reliable level of transparency into the supply chain. Only if you know the challenges at each step of a production process you are able to manage them and find possible solutions or alternatives. HENRIK: The biggest challenges for the industry and Sandqvist are to be found upstream in the supply chain. For us, the next big step is looking at the working conditions in the spinning units and the tanneries. I think most of us in the industry know that this is where we now find the biggest risks both concerning human rights and the environment, but for many, this is an overwhelming challenge. 2. How does your brand communicate sustainability aims and your progress towards business CSR/sustainability goals both internally to the business and externally to consumers? TONY: We work with Fair Wear on a workplan and share this with our team and suppliers. And share the scorecard on our website for our consumers. Design/development/supplier teams know that only sustainable fabrics can be used, so we only look for that. No exceptions made. On the garment we have a label which shows the sustainable raw materials used and on our website we show composition, fabric mill, stitching unit and laundry so a consumer can see where and how the garment is made. AIKO: We are reporting our sustainability progress on our website but also on group-level in our annual CSR Report. In addition, our retail arm uses an internal label “A Greener Choice” labelling products that go an extra-mile in terms of sustainability compared to equal products of that segment. HENRIK: In our own stores is where we meet the customers and where we can fully communicate what we do, everything from the organic cotton to Fair Wear Foundation and the second-hand sales and repairs. Outside our own brand stores, our homepage is the best way to communicate our sustainability work. We don't use a lot of on product communication, like the technical outdoor brands, as we want our products to have a clean and simple look. 3. What role does technology currently play in supporting your brand’s supply chain management? And how do you see using technology in the future to support transparency? TONY: First of all internet plays a great role in awareness , information and transparency of garments production. Consumers are able to follow the garment and learn more about production processes. In the production machinery in denim there is so much innovation in machines for weaving, dying, finishing, washing, etc. New machines use a lot less water, chemicals and energy. They are also working on technology to measure how much is safe where so the consumer gets more insight. In the future it would be great when each garment or lot has a chip to follow the patch we can all follow the way of the garment realtime, that is real transparency. AIKO: If you are talking digitalisation and efficient supply chain management: we are working on that topic and have – on group level – established a digital centre. We hope to enhance transparency, being able to make better informed decisions and also to serve the customer more on a needs/preferences basis. HENRIK: We have a very consolidated supply chain, at the moment, only four suppliers. One reason for this is to make our sustainability work possible and manageable. Because of this reason, we also don't need any advanced technology to keep track of our supplies and be transparent on everything we do, from cotton field to ready-made product. 4. How do you feel Brexit will impact your ability to carry out business within the UK? TONY: First of all I think that it is a shame that the UK is leaving the EU. I strongly believe that working together is better for the world than that each country does their own thing in economy, trade, environmental goals, immigration issues and world peace. I hope that the EU and UK work out a clear tradedeal where everybody knows what is coming. But things will change, imports might take longer, prices will rise, trade might be less between EU and UK. I count on sensibility of EU and UK leaders to work out a deal which works for both territories and hope the UK will join the EU again one day. AIKO: We hope we can continue doing business in the UK through our local subsidiary and that by that we are able to buffer some of the detrimental effects. We still need to see how the final agreement will look like. HENRIK: At the moment no one knows, but it will make nothing easier. And the insecurity about what it will mean does not make it easier to take decisions on our new investments in the UK, because we are expanding in the UK and we want to continue to grow there. 5. How can consumers engage with you to voice their opinions and help you to navigate the future? TONY: would love to do online consumer panels to get direct International feedback on our collection, concept, communication and service. Now we depend on local feedback and feedback through agents which is too slow for these fast moving times and is always coloured. We engage already consumers with projects like Re-use your blues where we send free second choice garments to consumers and doing a competition for who makes the most interesting Triple R (repair, reuse, recycle) piece and rewarding them for it. AIKO: We are active in social media and we are also inviting comments and inputs through customer surveys, joint events like Fjällräven Classic or Fjällräven Polar, stakeholder roundtable meetings and – mainly through our retail arms – interact with customers on a day to day basis. And of course: directly mailing the CSR office is always a good option. HENRIK: We are still quite a small brand, so we can still be completely open to anyone who wants to engage with us. Now any customer who contacts us regarding sustainability issues are redirected to me, and so far, I have been able to have a dialogue with each person who has contacted us. 6. What excites you about the fashion industry right now? TONY: Since I have been making sustainable fashion for 15 years, this year I finally see a strong interest and move from consumers, retailers, brands and suppliers to think different and create/buy sustainable products. There is no way back, but it took a long time while other industries moved/changed faster. Now it is time to catch up! AIKO: Less the fashion, more the lifestyle: that it now starts to go beyond consuming a product: it is embracing the full story of the life of a product and hence, also embraces sustainability already in the decision making process. HENRIK: The momentum, we are beginning to see more and more brands engage take on the sustainability challenge. We need everyone to take action, so far the industry has pointed to the few good examples that are out there, but that will never be enough, the great bulk of our industry needs to take action. 1. Sustainability has become increasingly a hot topic in the media. How do we make sure that the coverage is not a passing trend and becomes engrained in each magazine issue? SPORTSWEAR INTERNATIONAL (SI) is a specialised trade magazine and B2C multimedia platform that was founded in1975 and since then has established in-deep relationship with key insiders of the denim, sportswear, casual and fashion industry globally. Keeping a constant connection with the market has made SI’s team and managers grown increasingly aware about the importance of constant coverage of topics related to sustainability. Though, at the same time, maintaining a critical approach and selecting real news within a vast array of so-called sustainable industry practices is a fundamental part of SI’s activities and initiatives. 2. How does the concept of sustainability translate internationally? As long as ground-breaking and innovative projects or technology are developed they automatically become also interesting for SI to report about. Considering that the European and US textile and fashion industry were established earlier than in other parts of the world may lead to think that these areas are stronger and faster also in approaching the sustainability problem. Though, not less important, is how other countries and continents are trying and succeeding in finding solutions that can help textile massive production diminish its impact. For SI reporting on personalities, entrepreneurs, manufacturers and brands keen about preserving the environment is equally interesting no matter where they are based and how long they are acting in the business. 3. As a journalist you have a great platform to share, educate and inspire. How do you choose what to focus each issue on, is it instinctive or led by data/analysis? As previously explained, SI’s long time expertise and creative approach leads it to find topics and aspects that are crucial and most inspiring. By keeping constant relationships with the industry, its key players and insiders SI selects the hottest topics to concentrate on. It may happen that what SI decides to focus on is already stated through statistics, surveys and researches, though it may also choose to focus on yet unexplored fields. Thanks to Jacket Required, Louise & Andy at Village and all the panellists for a great discussion!